Today, I am pleased to host this guest blog written by Willem Post. Willem Post, Bob Hargraves, Howard Shaffer, Peter Roth, Steve Fox and I are all members of the local group, Coalition for Energy Solutions. Willem has both an MS in Mechanical Engineering and an MBA. He has many years of experience in financial estimation and oversight of large energy projects. 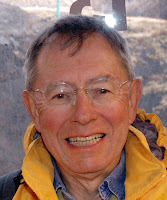 Willem has written several reports on energy subjects. The Coalition For Energy Solutions Research and Reports page includes links to these reports. This is his first guest post for Yes Vermont Yankee. 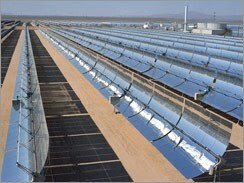 The BSPP will utilize solar parabolic troughs to generate electricity. Arrays of parabolic mirrors collect heat energy from the sun and refocus the radiation on a receiver tube located at the focal point of the parabola. A synthetic hydrocarbon is used as a heat transfer fluid (HTF). The HTF attains high temperatures (750 degrees F) as it is piped through the receiver tubes. The HTF is then piped through a series of heat exchangers where it releases stored heat to generate high- pressure steam. The steam is fed to a traditional steam turbine generator where electricity is produced. The plant is started in the morning and shut down in the evening. The annual production from the plant will be = 968 MW x 8,760 hrs/y x CF 0.26 = 2,200 GWh. The power varies daily and seasonally with the strength of the sun and is available only during the sunshine hours of the day. The NYTimes article states this power is enough for roughly 800,000 households. As a California household uses about 6,000 kWh/yr, about 4,800,000,000 kWh/yr would be required by these households. The NYTimes statement is grossly inaccurate, unless the writer meant that the power is enough only during the sunshine hours of the day. This is a sizable difference of 2,600,000,000 kWh. For a NYTimes writer to report on thermal power and not understand the real world and the numbers is truly incredible. Other power sources, such as pumped storage hydro, nuclear, wind, stored biogas (CO2 emitting) and fossil (CO2 emitting) will be needed to supply the 2,600,000,000 kWh during low-sun and sunless hours. Note: Wind power also varies daily and seasonally with the strength of the wind, and is not available at all when wind strength is too little or too much. As such variable power becomes a greater percentage of the power mix, one approach is to have a greater capacity of CO2-emitting spinning reserves. These are usually fossil power plants that are running without sending power to the grid, but they can be called on to instantly increase their outputs when required. Spinning reserves allow the grid to maintain its required steady voltage. If there is too much voltage variation, all sorts of electrical equipment will automatically shut down. The land will be leveled by bulldozers to accommodate the arrays. Even though it is desert, no fauna and flora lives there? The 11 square miles of surface will create a heat island in the desert, hotter than an equivalent desert surface that is partially covered with vegetation, as in New Mexico. Some of that heat will be radiated outwards and some of that will be reflected back. A new, hotter eco-balance will be created in that area. Building a large number of such plants will add to global warming. It runs counter to having white roofs on buildings to reduce the heat island effect and global warming. The force that drives this project is California's renewables mandate for utilities and the 30% federal tax credit; about $2 billion in this case. If a developer cannot use the tax credit, he can opt to get a check for $2 billion from the federal government. In other words, a check from all of us. A standard 1,000 MW nuclear plant for about the same cost as the above thermal solar plant would produce = 1,000,000 kW x 8,760 hrs/yr x CF 0.90 = 7,884,000,000 kWh/yr, 3.58 times the power of thermal solar plant. This power is steady and 24/7/365, i.e., it is available during all hours of the day, CO2-free, and will serve ALL the power needs of 1,314,000 California households for a year. New nuclear plants are designed to have useful service lives of about 60 years. A spreadsheet comparison of the lifetime costs of PV solar and nuclear plants would need to include the replacement of all PV panels and disposal of the old PV panels at a multi-billion dollar capital cost around the 25th year of the comparison. The 1,000 MW nuclear plant would require about 100 acres. This is only 1.5% of the land area required for the 1,000 MW PV solar plant. Given the above, it is to be expected that the smart and knowledgeable power industry experts in at least 30 major nations, such as the US, the UK, France, Germany, Sweden, Japan, China (building about 50% of the nuclear plants being built), India, etc., have convinced their governments to continue to opt for nuclear power as a major component of their future power mix. To do otherwise is a folly. 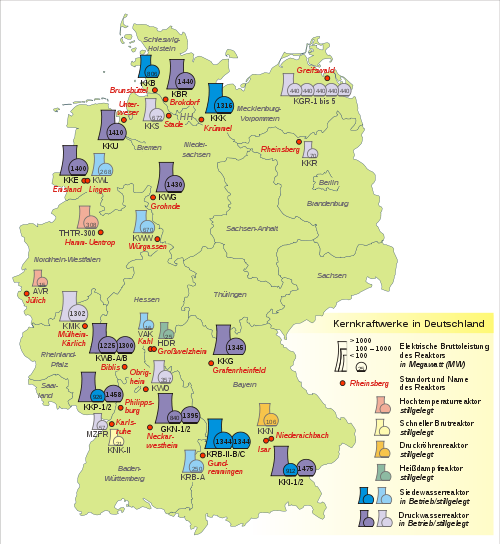 Several German power industry experts created, for demonstration purposes, a “renewables utility company” that uses several field-mounted, sun-tracking PV solar plants in southern Germany, several wind farms in northern Germany, several biogas-fueled combined cycle gas turbine plants with biogas storage tanks and several pumped storage hydro plants, all controlled from a central point to maintain a nearly constant output to the grid, as would any traditional utility company. The experts maintain that as it was shown to be technically feasable for a small combination of renewable power plants, it will be for increasingly larger combinations as well. This works in Germany because its national grid is designed as their cars and trains. For this to work in the US, its national grid, with about 1,000,000 MW of power plants connected to it, will need to be rebuilt at a cost in the order of $200-$300 billion during the next 10-15 years. Going “variable and renewable” has its costs. As an alternative, that level of funding could be used to replace 33,000-50,000 MW of the older US nuclear plants; no significant changes to the grid would be required. Two prestigious nuclear blogs are choosing to post good news on Mondays to start the week off well. Nuclear TownHall often posts Good News Mondays, while Dan Yurman posts Nuclear Energy Videos for Monday at Idaho Samizdat. People in the nuclear industry are doing things I greatly admire, but I sometimes don't think these things are "worth posting about." Now, I am going to honor these people and their accomplishments on Mondays. It's my contribution to a good week! Robert Hargraves and Margaret Harding. Robert Hargraves has been a active proponent of nuclear energy. He teaches the Rethinking Nuclear Power class at ILEAD (life-long learning at Dartmouth College), has written the book Aim High about the promise of thorium fuel cycles, and has presented talks on thorium to local meetings of the American Nuclear Society, the Mechanical Engineering Department at Columbia, as well as in many other venues. I can also recommend his Google Talk on thorium reactors. Bob has also been a steady supporter of Vermont Yankee relicensing. He wrote the popular letter suggesting that Vernon move to New Hampshire. When I posted it on my blog, it received amazing numbers of hits. Bob also did an excellent short slideshow on Vermont Yankee at the local Rotary Club. The slideshow is a fine introduction to Vermont Yankee. Bob and I are members of the Coalition for Energy Solutions, a local group of energy professionals. Most recently, the Coalition wrote a report countering the VPIRG ideas about replacing Vermont Yankee power with a mixture of wind turbines and solar. Bob is also the creator of the prosperity and birthrate chart that clarified so much in my post: It's the Energy. Why I Love Nuclear. Today, perhaps even as you read this, Bob is testifying before the Blue Ribbon Commission on alternative fuel cycles for nuclear. I find it very heartening that his tireless, fact-based work will be part of the Commission's deliberations. 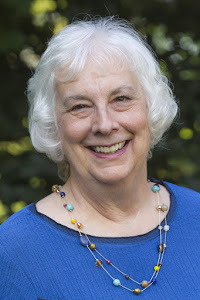 Margaret Harding is an experienced nuclear engineer who blogs at her web site, 4Factor Consulting. David Lochbaum, nuclear specialist and foe of the nuclear industry, has started a new series of blog postings at his employer's site, the Union of Concerned Scientists. His posts are called "Fission Stories." They describe mistakes and problems at reactors, mostly from the seventies and eighties, along with dire warnings that the same thing is likely to happen again tomorrow. For a long time, nobody challenged Mr. Lochbaum on these event descriptions. Most of us pro-nuclear advocates are busy with current events, not events from thirty years ago. Many of us don't have the expertise to truly go head to head with Lochbaum, who is a master of the half-truth. It takes time to dig up the old records in NRC and interpret them correctly. So Lochbaum's "Fission Stories" went unchallenged. His latest post is about power oscillations in boiling water reactors. Mr. Lochbaum posted a story on the Union of Concerned Scientists website about an event in 1988, then proceeded to link it to a 2005 event at a different plant and makes the case that the nuclear industry is filled with screw-ups and near misses......(However, in the 2005 incident) Perry's Option III system WORKED AS DESIGNED. On the Union of Concerned Scientist's site, Lochbaum is described as "widely quoted in the media and a frequent guest on network news programs." Maybe Lochbaum's half-truths have met the challenger they need. Hopefully, mainstream media will learn that they can get a great "he said she said" story if they quote Lochbaum and Harding. When they quote Harding, the things "she said" will be accurate. This will be a refreshing change from the current situation. 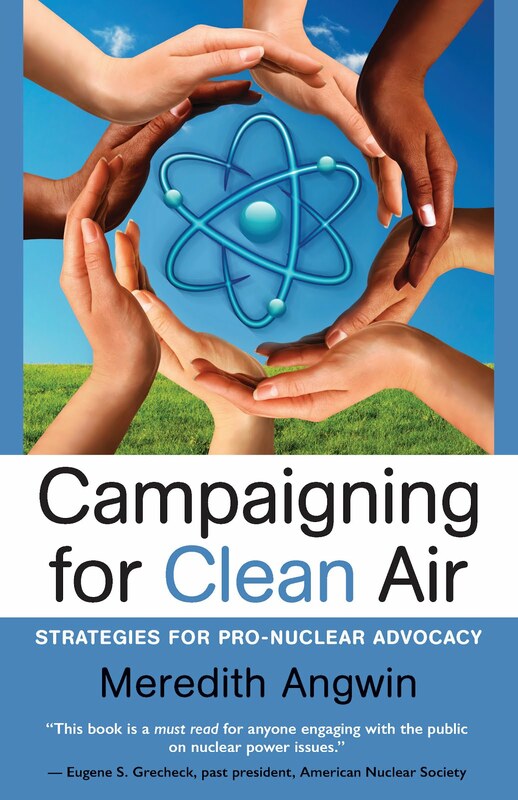 Nuclear advocates get tired of the constant, repetitive lies of the opponents. It is important to acknowledge the people who stand up for nuclear: testifying before committees or answering the half-truth assertions of well-known opponents. People like Bob Hargraves and Margaret Harding are making a difference for all of us. Peter Shumlin won the Democratic nomination for governor with 197 votes. Douglas Racine, the runner-up, knows that the last time Vermont recounted, the count changed by 239 votes. Racine has called for a recount. At Vermont Yankee last night, some alarm circuits failed due to an internal power supply failure. The "unusual event" (lowest-level emergency classification for the NRC) was declared at 7 p.m. and was lifted by 8:30. We can expect much handwringing from the opponents, who will explain that such an event means the plant is unsafe and everybody is going to die unless the plant is shut immediately. However, I want to point out Susan Smallheer at the Rutland Herald wrote a clear and accurate article about this blown-fuse "emergency". Thanks to Robert Hargraves and Margaret Harding for the use of their pictures on this blog. Vermont Yankee On the Market? Back in the days when I worked for EPRI or had my own consulting business, I read the Energy Daily. It's a well-reputed and very expensive ($2400 a year) daily update on the energy business. Needless to say, I don't subscribe any more. But I have friends in low places, and they shared an article from today's Energy Daily with me. The Energy Daily claims that Vermont Yankee is on the market, with NRG Energy and Exelon showing some interest. Of course, nobody at any of the companies will comment about this possibility. If Energy Daily can't get a comment, I'm not even going to try. What do I think about this? I think it could be a good thing for the plant and the state. Selling the plant won't change the opinions of the so-called "citizen's groups" that met with Jaczko, or the Eugenics Grannies. But it would give the Senate the ability to revote. After all, the plant would REALLY have new management with a sale. "They lied" would be off the table ("they" aren't there anymore) and the economics and reliability of Vermont Yankee would be far more visible. As a matter of fact, I suggested the positive aspects of a sale in a post in May called Entergy Communications. The psychological effect could be huge. Without some kind of drastic change, it is hard for a group like the Senate to reverse itself. There's a shame factor: "Were we wrong before, maybe? Are we admitting we made a mistake?" Love may mean never having to say you're sorry, but politics seems to insist on never admitting you need to be sorry. The political motto is: "I have never made an error, and I never will. Trust me." Relicensing Vermont Yankee at the 11th hour, with new management in place, would be completely precedented. Germany and Sweden came within inches of shutting down their nuclear power plants, by law. But as the day came closer, these countries became aware of all the natural gas they would be buying from Russia. It was Reality Check time, and their nuclear plants are still running. It is amusing to shout about the imagined dangers of nuclear power, but when it actually comes time to buy fossil energy off the grid from outside suppliers, people begin to object. Ordinary people who are not anti-nuclear activists prefer the plants that they know, the plants that have been running for ages, the plants that supply jobs and taxes to THEIR own jurisdiction. I read, somewhere, sometime, that Entergy put a pretty good rate on the table for selling electricity to Vermont utilities after 2012. I believe the rate was 6.1c kWh, which was the same as the "strike price" in the existing Revenue Sharing Agreement (item 4) of the Memorandum of Understanding. I don't think this rate was firm, though, so I am not going to try to look up the newspaper article in which it appeared. Entergy has also been battered by poor choices and poor publicity. As everyone who reads this blog knows, the problems were blown out of proportion. The tritium leak was small and fixed in jig time. Every investigation shows Entergy did not lie about the pipes. However, these accusations DID weaken Entergy's negotiating position a great deal. They put Entergy in the position of a beggar, really. "Please please let us keep the plant open, and we will give you whatever you want." Nuclear plants in general are changing their tune. They don't tend to be beggars anymore. When Germany decided to tax nuclear fuel rods as a simple way to bring revenue to the state, the utilities weren't standing still for it and threatened to shut the plants down. They aren't trying to stay open at any cost, with any taxation structure. This on-going fight in Germany is still, well, on-going. My point is that negotiating from a strong position ("You wanta buy from the Russians, huh? You wanta buy from the New England Grid at spot prices, huh?") 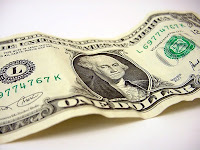 is likely to lead to more money for the group in the strong position. If Vermont Yankee is sold, the new owner will be in a stronger position, and the negotiations may be quite different. If Vermont Yankee is sold, a major motivation might be to let the Senate off the hook about reversing itself. In which case, Vermont would have only itself to blame for encouraging the change in ownership, and therefore putting itself into a worse negotiating position. Ah well. It won't be the first time politicos mess up. "I have never made an error, and I never will. Trust me." This statement is not a good way to get through life, or through politics. It is sure to cost someone some money, somewhere down the line. Vermont may have arrived at that place. New ownership at VY, higher priced power for everyone, but the Vermont Senate gets an "out" to reverse itself. Sigh. Correction: In an earlier version of this post, I wrote: "if Entergy is sold." I meant: "if Vermont Yankee" is sold. Thank you to Rod Adams for the correction. The Sixteenth Blog Carnival of Nuclear Energy is up at Idaho Samizdat. Once again, Dan Yurman has done a terrific job of choosing the best of the blogs, and putting things in perspective. There's Advanced Reactor Research at Brave New Climate, a terrific post from economist David Bradish of NEI Nuclear Notes on Nuclear and Job Creation, and CoolHandNuke on TVA refurbishing the Bellefonte reactor. Great stuff! Read and enjoy. Nothing like a Carnival on a late summer evening. Map of nuclear plants in Germany also from Wikimedia. Ferris Wheel also from Wikimedia. The latest Times Argus update shows that with all precincts counted, Shumlin has won by 178 votes over Racine and 390 votes over Markowitz. 73,000 votes were cast, a far higher turnout than expected. Matt Dunne, who lives in my area, gathered 15,000 votes to come in fourth. John Gregg of the Valley News wrote: Dunne Says He's Not Done With Politics. (Unfortunately, the Valley News did not put that article on-line.) In that article, Gregg noted that observers before the election thought that 15,000 votes would have been enough to win the nomination. Nobody expected a 70,000 vote turnout. A recount may be called, since two candidates, Racine and Markowitz, are within 2% of the votes cast for the leading candidate. Either of them is allowed to ask for a recount. Last time there was a recount in Vermont, the swing (difference in votes) was 239 votes, more than Shumlin's margin of victory. In other words, it's still too close to call. I live near White River Junction, and one of the wonderful new things about White River Junction is the Center for Cartoon Studies. Sarah Stewart Taylor, Matt Dunne's wife, teaches there. One of my favorite cartoonists, James Sturm, is one of the co-founders of the school. Full disclosure: Taylor and Sturm both donated signed copies of their latest books to a charity auction I was involved in. They were both very gracious when I asked them to donate. James Sturm accompanied Matt Dunne on a final electioneering push, the day before the elections. Sturm and Katharine Roy have an excellent report of that day posted at Slate magazine now: Honk and Wave. The small town feeling of a Vermont campaign is captured in this short "dispatch in comics." I encourage you to look at it. As of this morning, the race for Democratic nomination for governor was too close to call. Here's the Times Argus Update at 8:41 a.m.
That's 87 votes out of about 64,000 cast. Shumlin, Racine and Markowitz each have around 17,000 votes apiece, while Dunne (14,000) and Bartlett (3,500) together have about as many as the front runners. Update: While I was writing this, Racine pulled ahead by 60 votes. Too close to call, indeed! Follow the link for the latest. Further Update: With all precincts counted, Shumlin is ahead by 178 votes. All three of the front runners (heck, all five of the Democratic candidates) are against relicensing Vermont Yankee. From a practical point of view, it may not matter which Democratic candidate wins. However, plant supporters generally put Peter Shumlin at the top of the list of candidates they don't like. Shumlin rushed the Senate vote against the plant in order to score political points before Town Meeting. He went on public TV and explained that solar could make up the VY power because Germany gets 30% of its "juice" from solar. (Germany gets 1 % of its electricity from solar.) His understanding of the fundamentals of energy production is poor. Moreover, his remark shows a certain deep carelessness. Shumlin is not a man who checks his facts, which should worry people even if they don't support Vermont Yankee. Phil Scott won his primary race on the Republican side, and will be the Republican nominee for Lieutenant Governor. Phil was one of the four senators who voted in favor of Vermont Yankee. Here's a video of what he said at that time. "I’m very happy and relieved," said Scott, businessman and race-car driver. "We brought together a different style of campaign, one where people had fun," he said.....Snelling appeared to tap his family’s long-time connections within the party for support, while Scott, who races cars at Thunder Road, scouted supporters outside the party’s inner circle....(Scott) had a reputation for working across party lines to achieve results. Or at least, it will be counted. Like mommy, like daughter. An independent voter. As many reporters and pundits have noted, there are few essential differences between the five Democratic candidates in their views on the budget, health care, education, economic development, agriculture, human services, and energy and the environment. I used to be able to tell them apart. Peter Shumlin was running on his anti-Vermont Yankee stance and Green Jobs, Matt Dunne was running on Vermont needs broadband and Green Jobs, Deb Markowitz was running on her experience as Secretary of State and Green Jobs, and Racine and Bartlett were running on Green Jobs. In recent days, the five candidates have been poaching on each other's positions. They have destroyed any lingering differentiation they used to have. For example, two days ago, Peter Shumlin's people came to my house and left a full-color flyer on how Vermont needs broadband. I wondered: Wasn't that Dunne's big deal? Maybe Dunne was doing well with it and Shumlin decided to get in on the action. Meanwhile, Dunne made a web video ad about his experience, which I thought was Markowitz's strong suit. It's as if they are all changing places and stealing each other's talking points. Maybe they are just trying to confuse me. The bottom line for me, however, is that they are all opposed to the relicensing of Vermont Yankee. I don't know why it they are all against relicensing. 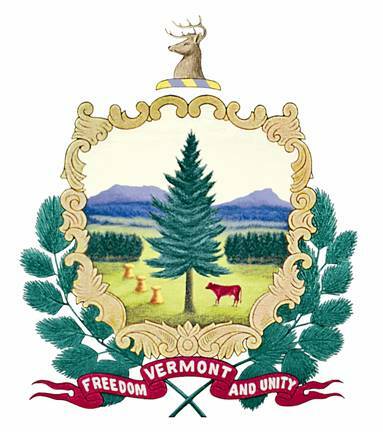 In the Vermont Senate, twenty six Senators voted to not relicense Vermont Yankee and four voted to relicense it. The four votes for relicensing came from two Republicans and two Democrats. You can't get much more bipartisan than that. And of course, the negative votes came from all three parties. So why do all the Democratic candidates for governor speak with one voice against Vermont Yankee? I had two ideas about this. My first idea was very simple: they all hate the plant. My second idea was almost as simple: they think everyone in Vermont hates the plant, and they won't get elected if they support it. Recently, a third possible idea was suggested to me by a savvy old-timer. He said that all the Democrats may have bought into key points of the Progressive Party platform so the Progressives wouldn't run their own candidate for governor. A Progressive candidate would have been a "spoiler" and ensured a Republican victory. However, the Democratic neo-Progressive platform makes all the candidates look alike on key issues. Who knows which idea is right? Not me. I just wish the five Democrats had had the courage to differentiate themselves from each other. It could have at least made the election a little more fun. Maybe one of these Democratic candidates could even have supported Vermont Yankee relicensing. A power plant should not be a political platform, like "taxes" or "school choice." A power plant is a big piece of industrial machinery that provides low-cost power. It would have been nice if one of the Democratic candidates for governor had noticed this. 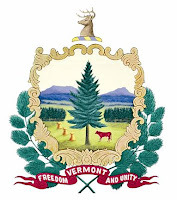 For a more complete view of the primary, complete with predictions about what will happen with low, medium and high voter turnout, I recommend Shay Totten's blog post at Seven Days Blurt: Vermont's Primary: Are We There Yet? At various public meetings, the Vermont Yankee "Raging Grannies" hand out a quote from Alice Stewart. This quote is basically a summary of eugenics. Over the past week I have had four blog posts on the subject. The first post described the grannies. The next three posts talked about how the quote fits into the eugenics agenda, and why we should care. My first post, Older and Unthinking, described the Grannies trespassing and arrest at Vermont Yankee. Some of the women have been arrested at the plant nine times, but charges are never brought against them. I suggested that being old shouldn't give you a pass on repeated lawbreaking. My next three posts were about the Alice Stewart quote and its implications. The quote is distributed at public meetings by the grannies. Stewart claims that any mutation will spread through the population and contaminate the gene pool. A "bad seed" will build "defective genes into the population" and these will "never be rooted out." This is the standard form of the eugenics argument: discrimination against people who are "defective" and have "defective genes." The argument has been used to forcibly sterilize imbeciles. Often, "imbecile" is defined as "person of another race" (such as the Abenaki First Nation in Vermont). When I objected to receiving the eugenics handout at a Public Service Board meeting, I was roundly booed by the plant opponents. My first post on this topic described the prinicples of eugenics: Grannies and Eugenics, the Cruelty of Ignorance. The second post talked a little about Alice Stewart and her philosophy, and also explained why Vermonters, especially, should avoid making the eugenics argument. Eugenics frequently starts by trying to rid the world of "defective" genes and people, but it usually moves on to outright racism. That is what happened in Vermont with the Abenakis. 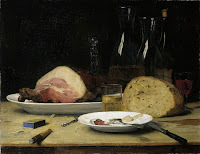 My post: Alice Stewart's Work. Also, How Eugenics Affected Vermont. My third post described modern genetics, and why "defective" genes don't actually build up in a population: Genes in Populations: A More Modern View. The bottom line on all of this: The eugenics model is not how genes spread. Believing that eugenics is the correct model is cruel and eventually racist. The grannies should stop handing out eugenics literature at public meetings. A Retrospective on the Posts: What About the Grannies Themselves? There is another bottom line. Do I think the Grannies themselves are racist? No. I think they are ignorant of what they are doing, rather than racist. They found a quote from Alice Stewart, and it fit with their ideas about how bad radiation is: "See, one bad gene can ruin the whole gene pool!" know very little about many aspects of regular history (Hitler and eugenics, Vermont and the Abenaki and eugenics). I think they simply don't know they are distributing a quote that summarizes the world-view of eugenics, from a person (born in 1906) who may have written these words during the hey-day of eugenics in the 30s. That's why I titled my first post: the cruelty of ignorance, rather than the cruelty of racism. That's also why I refer to them as the "eugenics grannies" not the "racist grannies." Ignorance can lead to very bad results, however. Including racism. I announced the Fifteenth Blog Carnival of Nuclear Energy in one of the eugenics posts. It was pretty well buried in the post, so I repeat it here. The Fifteenth Blog Carnival of Nuclear Energy is up at Next Big Future. Nuclear Townhall notes that the Bellefonte plant at TVA is set to move forward again (construction was stopped in the 70s). Dan Yurman discusses the license process for Small Modular Reactors, and Charles Barton has a post about Australian climate scientist Barry Brook and his move to nuclear. Steve Aplin reviews the movie Countdown to Zero, about nuclear proliferation, including important insights about Iran's program. Brian Wang has put together a very interesting and eclectic mix of blog posts. Thank you Brian. Come to the carnival! You always learn something, and it's fun, too! I was honored and flattered to be on Rod Adams Podcast yesterday evening. Three of us discussed various topics, including the slowdown of the nuclear renaissance in this country. The three participants were Rod Adams of Atomic Insights blog, Charles Barton of Nuclear Green Revolution blog, and myself. Download Atomic Show Podcast #160, Bumps in the Renaissance Road to hear what we said about the Renaissance, nuclear art, and more. Yes. I'm off topic and talking about our daughter again. In a previous post I noted that our daughter Julia Angwin is a Wall Street Journal tech editor. She just finished spearheading a major WSJ investigative project on "What They Know." This project explores what Internet marketers know about you. The WSJ web site for the project has databases and interactive graphics so you can explore your own experience. Since then, Julia has been on several radio and television programs, talking about the project. Here is a link to see her on C-Span (forty minute interview). And here's a link to her appearance on the the NPR radio show On Point. This episode had the intriguing title of Creepy Commerce. In this program, Julia was on a panel that included an internet advertising executive. Nothing like controversy to make a show exciting! 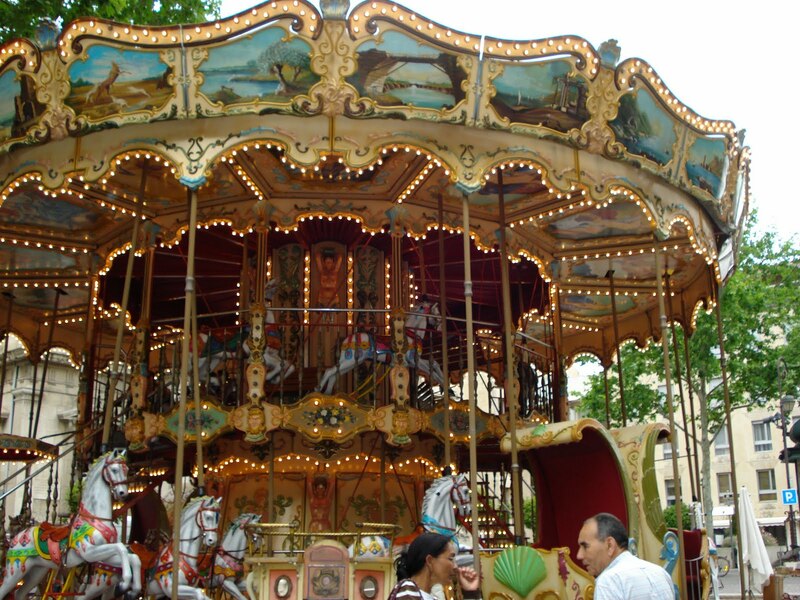 Carnival Image is the Carousel in the square at Avignon. Quicktime Oversimplified Genetics: So What Happens to Genes in Populations? Since I have spent so much time on eugenics and Alice Stewart and the eugenics Grannies, I want to spend a little time on real genetics. As I mentioned in earlier posts, we all contain less-than-ideal genes. However, such genes don't "build up in the gene pool" as eugenics and Alice Stewart believe. Here's a part of Stewart's quote: It's the genetic damage, the possibility of sowing bad seeds into the gene pool from which future generations are drawn. There will be a buildup of defective genes into the population. It won't be noticed until it is too late. To understand why defective genes don't build up and fill the gene pool, we have to talk about genes a bit. Full disclosure: the following sections are oversimplified. Some genes are recessive. They only express themselves when two people carrying the same gene have a child. 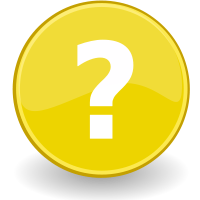 For example, two people carrying Tay-Sachs gene could have a child who dies young of Tay-Sachs, but if only one parent is carrying the gene, the child will not have the syndrome. Aside: If the gene leads to a visible result in the child, such as a child afflicted with Tay-Sachs syndrome, it is said that the gene is "expressed" in the child. This is an oversimplification of the term "expression" for genes, but I can't think of a better term. I could begin referring to genotypes and phenotypes, but that would make this post completely unreadable. End aside. Since there are so many genes, we are all carrying some bad recessive genes. The way to avoid having these genes expressed in the children is to marry someone who doesn't share lots of genes with you. This is why first-cousin marriage is illegal in some states. The two cousins share so many genes that negative recessive genes are more likely to be expressed in the child. Anthropologists have found many example of matrimonial moieties in societies. The society is divided into two kinship groups by descent (two moieties), and it has a marriage rule that everyone must marry someone from the other kinship group. This type of rule lessens the number of children with a double dose of a negative recessive gene. Other societies have other types of exogamy (marrying out) rules. Not all societies have these types of rules. Negative recessive genes have been with the human race for a long time, and society has found some ways to mitigate the problems they cause. The usual method of mitigating recessive gene problems is to avoid inbreeding. What about negative genes that are "dominant?" A dominant gene expresses itself in the child, even if only one parent has the gene, and gives it to the child. In general, dominant negative genes do not spread widely because they decrease the fitness of the person to have children. They certainly don't cause a "buildup of defective genes in the population" as Alice Stewart claimed. As a matter of fact, negative dominant genes usually die out very quickly in the population because they decrease biological fitness. Some negative dominant genes remain, however. Huntington's Disease, which killed Woody Guthrie, is caused by a dominant lethal gene. Only one gene from one parent is enough to cause the syndrome and eventually cause death. However, since the Huntington's gene often doesn't express itself until the affected person is middle-aged (Guthrie died in his fifties), a person with the Huntington's gene can still live to have children. Therefore, the gene continues in the gene pool. It certainly doesn't spread and "contaminate the whole gene pool" and so forth, but it does remain in the population. I am grateful for music written and sung by Woody Guthrie and his son Arlo. I am glad that no eugenicists were around to make sure that people with Huntingtons didn't contaminate the gene pool! Dominant lethal genes are just as bad as it gets, genetically. Yet people with such genes can contribute to the strength and joy of society. To prove it, this video of a song from the man with Huntingtons. Another aside: Of course, what is positive and what is negative in a gene is not as clear as it used to be, either. Sickle cell disease is caused by a double dose of the sickle cell gene. However, a single dose of the gene, sickle cell trait, is protective against malaria. Modern genetics is not as simple as eugenics, which may be why the Grannies don't quote it. End Aside. In the days when eugenics was popular, the right of a person to reproduce was considered subservient to more important goals of society. This was reflected in the Stewart quote about "genetic damage" and the "buildup of defective genes in the population." At that time, society's goals were stated in terms of protecting the gene pool, ridding society of imbeciles, and so forth. Often, as in Vermont and the Abenakis, the definition of imbecile was "people from another ethnic group." The Stewart quote above and the Oliver Wendell Holmes ruling quoted in earlier posts exemplify this world-view. Now, things are different. Genetic testing is common. While it is common to abort fetuses that have genetic problems, it is not universal to do so. (I am not arguing for or against abortion here, just pointing out that debates about the subject are NOT debates about saving society and the gene pool from defective genes.) Special-needs children are not called "imbeciles." They are not warehoused in institutions until they die. They are treated as the human beings they are. In other words, the conversation about genetics has changed. It's a private conversation nowadays, a conversation about individuals. It's a kinder conversation, too. Society has grown in thoughtfulness and compassion as our knowledge has grown. For most people, the cruelty embodied in the early 20th century views of genetics is a thing of the past. Human dignity is now considered more important than protecting society from "defective" genes. I hope the eugenics Grannies will soon join the twenty-first century, at least in terms of genetics and human dignity. In the previous post, I wrote about eugenics in general and how the Grannie's handout expressed the eugenics worldview. In my opinion, the post was not specific enough in some areas. 2) Why people in Vermont should be particularly concerned with avoiding support of the eugenics agenda. The topics fill in the gaps of my previous post. I do not mean to imply that Stewart directly practiced eugenics in Vermont. Alice Stewart is the author of the eugenics material handed out by the anti-nuclear grannies at a recent Public Service Board (PSB) meeting. I described this in a post about anti-nuclear activists and eugenics. A little about Alice Stewart. She was born in 1906, and Stewart's biography in Wikipedia tells us that she was a physician who studied the effects of radiation. She started off by doing good things: for example, her work encouraged pregnant women to avoid x-rays. As I read it, later in her life she began to allow ideology to dominate her science. She apparently allowed a co-worker to fudge data about excessive cancers in workers at Hanford. This whole matter is still highly controversial: what she knew, what the co-worker did, and so forth. In the Hanford work and other work, Alice Stewart was defending the linear non-threshold model of radiation damage. Her work (her error?) shows radiation to be more damaging than other studies reported. She is a hero to those who are opposed to nuclear power. For example, she received the Right Livelihood Award, an award also given to Armory Lovins. It's the genetic damage, the possibility of sowing bad seeds into the gene pool from which future generations are drawn. There will be a buildup of defective genes into the population. It won't be noticed until it is too late. Then, we'll never root it out, never get rid of it. It will be totally irrevocable. Eugenics was popular in Vermont, to the everlasting shame of the state. In the twenties and thirties, the indigenous Abenaki Indians were targeted for sterilization because of their "defective genes." 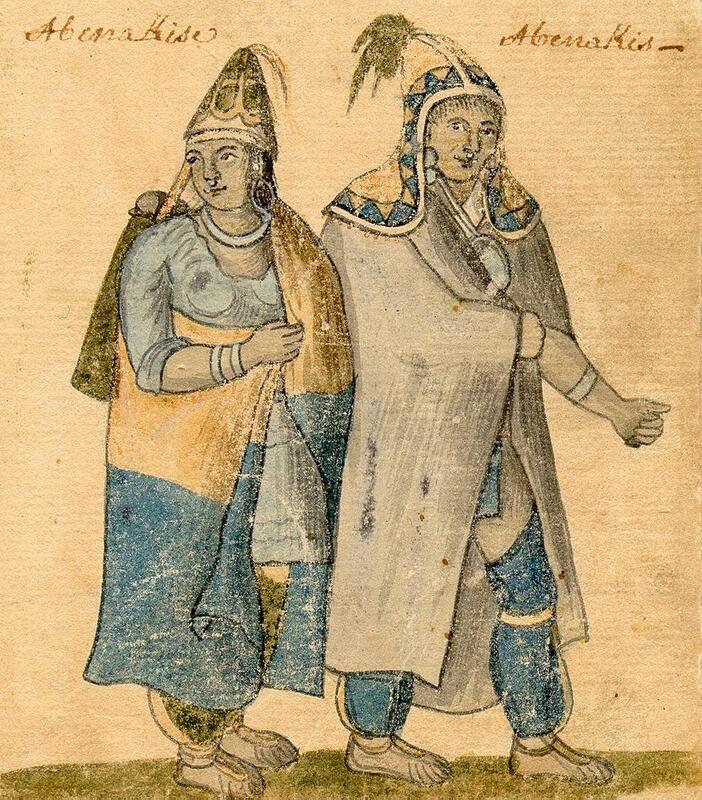 According to their enemies, Abenaki were trying to disguise themselves as French Canadians, but they were actually degenerate "river rats." Hundreds, possibly thousands, were sterilized. Being identified as an Abenaki was dangerous. For example, playing the drums at home could bring the police, and the household might be added to a list of "degenerates." The Ndakinna Cultural Center encourages Native American Culture in Vermont. 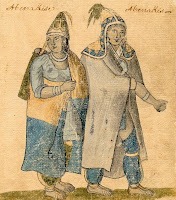 Its website includes an excellent summary of the situation on the page: Eugenics in Vermont and the Hidden Lives of the Abenaki. It affected many Vermonters, including my grandmother's cousin, who was seized, put in a mental institution, and sterilized. The reason. He was Abenaki....the surviving victims of the Vermont Eugenics society (have not been) recompensed in any way for the pain and suffering they've been through. Grade 8 Up—Molly and her Abenaki family get caught up in a government eugenics project set to rid Vermont of "weak links" in the genetic code. At the booksigning, I liked Ms. Kanell and I liked her writing style. I didn't buy the book because the subject felt too dark for me. I feel bad about that. I didn't want to contemplate the painful past. As humans and as Vermonters, we can not allow the cruelties of the past to become the way of the future. We must avoid supporting the agenda of eugenics. Obviously, this starts with refusing to distribute or support eugenics literature. The Eugenics Grannies should be ashamed of themselves. 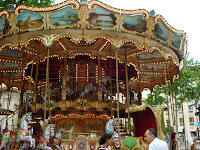 It's Blog Carnival Time Again! The Fifteenth Blog Carnival of Nuclear Energy is up at Next Big Future. Nuclear Townhall notes that Bellefonte plant at TVA is set to move forward again (construction was stopped in the 70s). Dan Yurman discusses the license process for Small Modular Reactors, and Charles Barton has a post about Australian climate scientist Barry Brook and his move to nuclear. Steve Aplin reviews the movie Countdown to Zero, about nuclear proliferation, including important insights about Iran's program. Brian Wang has put together a very interesting and eclectic mix of blog posts. Thank you Brian. Come to the carnival! You always learn something. Racism and the "Raging Grannies"
Stewart was an early pioneer in radiation research. She was born in 1906, and spent her youth and young adulthood during the heyday of eugenics. Her quote above is a clear statement of the all-too-common Eugenics view, which was widely held in the early to middle of the 20th century. As science, this is complete bunk. We know a great deal about how genes propagate in populations. Eugenics is wrong. Eugenics is just a stupid incorrect model, based on fear and prejudice, and pushed for a political agenda. After WWII, eugenics went out of fashion, having reached its zenith under Hitler. By the way. Hitler didn't go after the Jews first. He went after the retarded, the ones with "defective genes" that had to be "rooted out." Hitler started with eugenics, sterilizing and euthanizing retarded German children. With this success behind him, he later expanded his reach. Wouldn't it be nice if it was just evil Mr. Hitler who followed Eugenics? It wasn't. America and Britain were at the forefront of the movement. People in America sterilized the retarded at a great rate: 20,000 sterilizations in California alone. Buck vs. Bell was a Supreme Court case in 1927 about whether the retarded could be sterilized by the state. The answer: They could be sterilized without their consent. As Oliver Wendell Holmes, Justice of the Supreme Court, wrote in his opinion on Buck vs. Bell: "Three generations of imbeciles is enough." According to the Wikipedia article about this case, the woman who was sterilized was an avid reader, and her only daughter (a girl who died young of measles) was an honor student. When you are sterilizing imbeciles, I gather you also get to choose who is an imbecile. There's an extremely disturbing video of the Buck vs. Bell case, with footage from 1927. I decided not to embed it. I'll add a picture of Frances Galton, the father of Eugenics instead. Handsome guy, yes? Let's have some eye-candy. I Speak at the Meeting. People Boo. Back to Alice Stewart and the PSB meeting. At meeting where this yellow sheet was handed out, we could sign up to give two minute opinions about Vermont Yankee. I spoke briefly about Yankee. Then I objected to being handed racist eugenics material at a public meeting about a power plant. I was roundly booed as I spoke. People hissed that I should learn some history. They shouted that Alice Stewart was not a racist. It was all very upsetting. The opponents of the plant simply could not see this handout for what it was. Ignorance is Ignorance. Ignorance is Cruelty. I'll write a in another post about how our knowledge of genetics has grown. Right now, I just want to say that in their eagerness to show what immense, irreparable harm nuclear plants do, the Grannies ignore modern biology. They have chosen eugenics as the biological model that better suits their needs to bash the power plant. They have gone too far for me. Let me address the Grannies here. Stop handing that Alice Stewart statement out. Okay? Stop using those eugenics arguments. Can't you read that statement? Can't you read how the same words are about Defending the White Race and rooting out defects? Just stop it. Bash nuclear power some other way. As I said above: Eugenics is wrong. Eugenics is just a stupid incorrect model, based on fear and prejudice, and pushed for a political agenda. And be a little humble, my friends. We are all carrying less-than-perfect genes, and the more we learn about genetics, the more we begin to know about our own genes. People have genes that carry higher risks of breast cancer, alcoholism, autism, you name it. You begin talking about "never being able to root out bad genes," and you are forgetting the part about genetic heritage that can be described as "for whom the bell tolls." It tolls for thee. And for me. And for all of us. 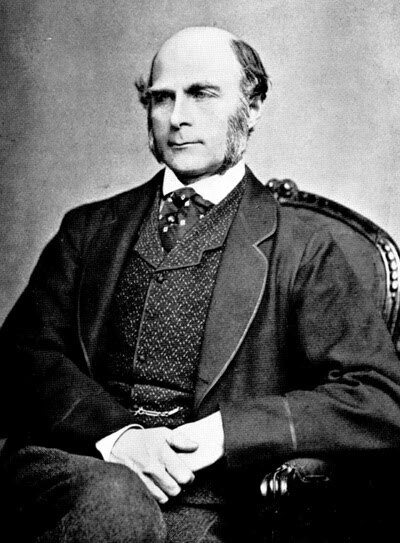 Photograph of Francis Galton, the Father of Eugenics, from Wikimedia. Karen Street blogs at A Musing Environment. The subtitle of her blog is A Friend looks at (mostly) the environment. 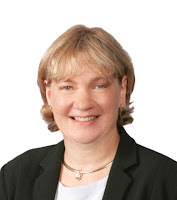 Karen blogs from the somewhat unusual perspective of a member of the Society of Friends who is not opposed to nuclear power. The Friends do not take "creedal" positions. However, as a practical matter, the Friends emphasis on Christian pacifism has (mostly) spilled over into an anti-nuclear stance. 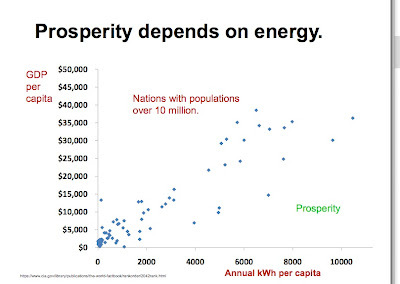 One of your graphs shows among countries with GDP per capita over $30k, kWh per capita is >2.5x for some than others. I add this because it can sound as if people advocating for the poor are also advocating for my right to waste. A lot more people will agree with you if you make this point. I think that energy gives us choices, no matter how rich we are, and I answered Karen's comment in my post Prosperity for Rich Folks. Late last night, Karen commented upon that by sending a link to her most recent post, a very thoughtful essay about the environmental and spiritual dangers of excess. I have another post about those grannies scheduled for later today, and a very busy morning ahead of me. I couldn't reply immediately to Karen's post anyway; I need to do some thinking about it. However, I didn't want the link to her post to remain buried deep in the comments of an older post on my blog. So here's the link and I encourage you to read it. Are we richer if we make perceived convenience the priority? The video above is not from the most recent arrests of elderly women at Vermont Yankee. It's about a year old, from the Rutland Herald covering the September 2009 arrests of the same elderly women at Vermont Yankee. Nestel said she didn't at all feel frustrated by the lack of prosecution, and she said the act of civil disobedience was a profound experience for the protesters. By trespassing on the plant grounds, the older women play chicken with the guards, disrupt the plant, and make sure Vermont Yankee gets negative publicity. If a guard actually shot them, Vermont Yankee would get even worse publicity. It's a good thing the guards are well trained to safeguard the plant while avoiding the use of force. I know some people who work at the plant who might well say: "Oh, don't tempt me!" However, the protesters do have a profound experience when they protest. That's got to be worth something. If the plant and the prosecutor feel like pressing charges, I think they should press charges. If they decide that pressing charges will just clutter up the court system, they shouldn't press charges. However, as a grandma myself, I believe very strongly that this decision should be made without respect to the age of the law-breakers. I don't believe people should get a free pass to disobey the laws because they are older. If I broke a law, I would expect Bad Things might happen to me. If I broke laws repeatedly, I expect that Bad Things (like jail time) would certainly happen to me. I learned cause and effect about law-breaking back in civics class, in sixth grade. They didn't have these new-fangled horseless carriages back then, but us kids really learned. Oh. Okay, I'm not that old. I'm basically a Boomer. My opinion. Trespassing and tempting people to shoot you is not funny. I think that someone should bring charges. Let's not have a tenth set of arrests and get-out-of-jail-free cards. On Friday, August 6, the Nuclear Regulatory Commission (NRC) turned down a request for enforcement against Vermont Yankee by the New England Coalition (NEC). In June, the NEC had asked that Vermont Yankee be required to operate its core at a much lower temperature. The NEC claimed that zirconium alloy (zircaloy) cladding is a fire hazard at Vermont Yankee's current operating temperatures. 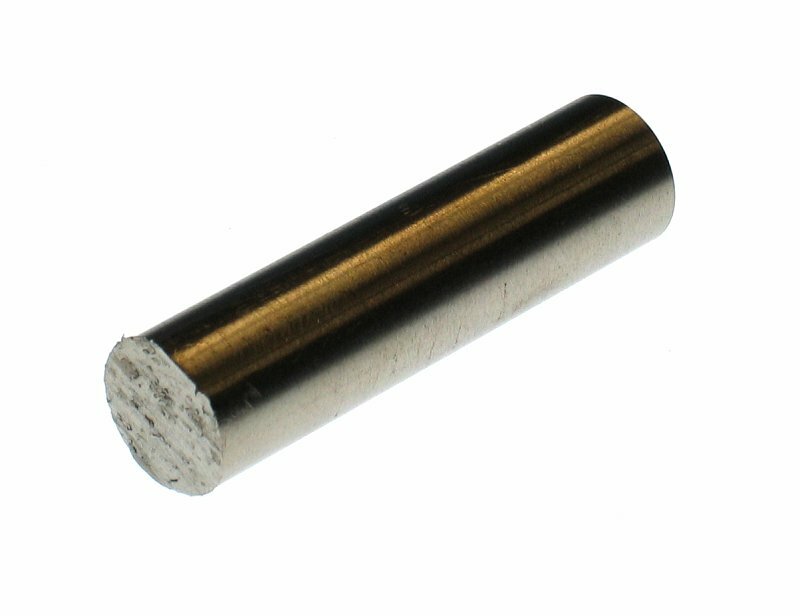 Why all the concern about zirconium cladding? Fuel pellets are made of oxides (mostly uranium oxide) and can't burn. However, the fuel pellets are encased in zircaloy, which is metallic. Metals don't generally burst into flame. However, unlike oxides, metals can burn. So it is reasonable to be concerned about the temperature at which zircaloy will burn. The NRC regulation for maximum temperature of light water reactor fuel cladding is 2200 F, while Vermont Yankee plant operates at 2060 F or below. However, NEC asked the NRC to rule that Vermont Yankee must operate with fuel cladding temperatures no higher than 1700 F. Naturally, the NRC turned down this request. No reputable regulatory agency is going to tell a plant that is in compliance with regulations: "Sorry. You think you are in compliance, but you aren't in compliance. We have changed the regulations and made them far stricter, just for you." Besides being unfair, this would be a great way for a regulatory agency to get itself sued. Of course the NRC didn't do this. After several conference calls with people from NEC, the NRC sent NEC a letter basically saying: No. We're not going to tell Vermont Yankee to operate at a lower temperature. Your concerns are more generic than anything specific to Vermont Yankee. Your concerns will be forwarded to our area for general rulemaking. You can download the letter the NRC sent NEC here, and also read the Brattleboro Reformer article on the ruling. The request above was specific to Vermont Yankee. It was filed by NEC in June of this year, and turned down at the beginning of August, as described above. However, there was an earlier request by Mark Leyse, a nuclear engineer and the son of Robert Leyse, also a nuclear engineer. Mark Leyse lives in New York city. Mark Leyse has made many requests to the NRC for re-evaluation of safety measures. He is particularly concerned with fuel cladding, apparently believing that the NRC has ignored his father's research results on this issue. The NRC earlier in spring had already agreed to consider the matter raised by Mark Leyse of New York City, but in a review track that will take years, not months. The New England Coalition wants the margin of safety increased immediately. Leyse and Raymond Shadis, senior technical adviser to the coalition, say Vermont Yankee’s peak cladding temperature of 1,960 degrees Fahrenheit only gives the plant operators 30 seconds to react during a loss-of-coolant incident scenario. Thirty seconds. Sounds terrible, doesn't it? And "takes years, not months" sounds perfectly awful. I decided to review Mr. Leyse's letter, because I couldn't figure out some of the comments in the press. What does reactor operating temperature have to do with loss-of-cooling accidents (LOCA)? Of course, to some extent, a hotter reactor is slower to cool, but everything about a LOCA analysis is built with huge margins of error. And how could forty-year-old lab data be ignored by everybody, when zircaloy must be one of the most-studied compounds in the world? Zircaloy it has been used for cladding since the very first reactors, and people have been studying it forever. Just Google "Zircaloy" to see the endless lists of papers and references. And, of course, my major question. If zircaloy bursts into flame in water above 1700 Fahrenheit, and reactors routinely operate at 1900 Fahrenheit, how come they haven't all burned up already? 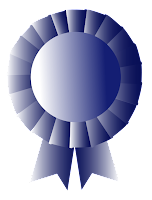 I reviewed the document to the best of my ability, and I welcome comments that will improve my review. Here's my analysis, with some quotes from Leyse's letter to NRC. The Leyse request doesn't just refer to the temperature at which zirconium might burn in water. Instead, it also says that the modeling of loss of cooling accidents, the flood rate of water into the core, and the Baker-Just and Cathcart-Pawel equations non-conservative for calculating the temperature at which an autocatalytic (runaway) oxidation reaction of Zircaloy would occur in the event of a LOCA. .....Additionally, it can be extrapolated from experimental data that, in the event a LOCA, a constant core reflood rate of approximately one inch per second or lower (1 in./sec. or lower) would not, with high probability, prevent Zircaloy fuel cladding, that at the onset of reflood had cladding temperatures of approximately 1200F or greater, from exceeding the 10 C.F.R. § 50.46(b)(1) PCT limit of 2200 F.
In other words, this is not just about zircaloy. In this petition. Mark Leyse claims that just about every model used in the nuclear industry is inadequate. Zircaloy properties, LOCA calculations, reflood calculations--all wrong. In 2002, his father, Robert Leyse, said the same thing. The elder Leyse petitioned the NRC for rule-making about the Baker-Just and Cathcart-Pawel equations and LOCAs, and the NRC found his contentions to be not scientifically valid and wrote him to that effect in 2005. This latest contention by Mark Leyse is a replay of this 2002 petition by Robert Leyse. Unfortunately, the NRC cannot just say: "Hey, we did this before. These contentions were made in a petition in 2002, and we settled these points in a ruling in 2005." No, they have to look at it again. This gives the opponents of nuclear power the opportunity to complain that it takes the NRC three years to look at anything. Robert and Mark Leyse seem to believe that all the research that has been done over the past forty years on LOCA modeling, zircaloy properties, and pretty much everything else....is part of a vast conspiracy to provide just the results the utilities want. The Leyses, and the Leyses alone, have the real facts, the true equations, the correct models. They discovered these "facts" forty years ago and have been ignored ever since. I call this a conspiracy theory, decked out in scientific trappings. Of course, once you buy into the idea that everything known about nuclear is wrong, then you can come up with scenarios where the entire core bursts into flame in thirty seconds and there is nothing anybody can do about it and so forth. This plays well with the anti-nuclear groups. It doesn't play well with me. In science and technology, everything builds on what has gone before. Even the Einstein's famous breakthroughs were built on the past. He reviewed experiments that could not be explained without new ways of thinking about the speed of light. Einstein was attempting to explain the very latest experiments when he wrote his breakthrough papers. I've done research, supervised research, and I deeply value research. Conspiracy theories that decide to ignore forty years of research should be called exactly what they are. Conspiracy theories. Update: NRC review of CORA tests, interim ruling now available here. Simplistic summary of NRC ruling: these results are in line with our other tests, and no rule changes are necessary. Zirconium rod (not zircaloy) from Wikimedia. Morality for Beautiful Girls is the title of a book in Alexander McCall Smith's No. 1 Ladies Detective Agency series. The title raises all kinds of intriguing questions: Is it harder for beautiful girls to be moral? Do beautiful girls need morality? Why would morality be different for "beautiful girls" than for anyone else? 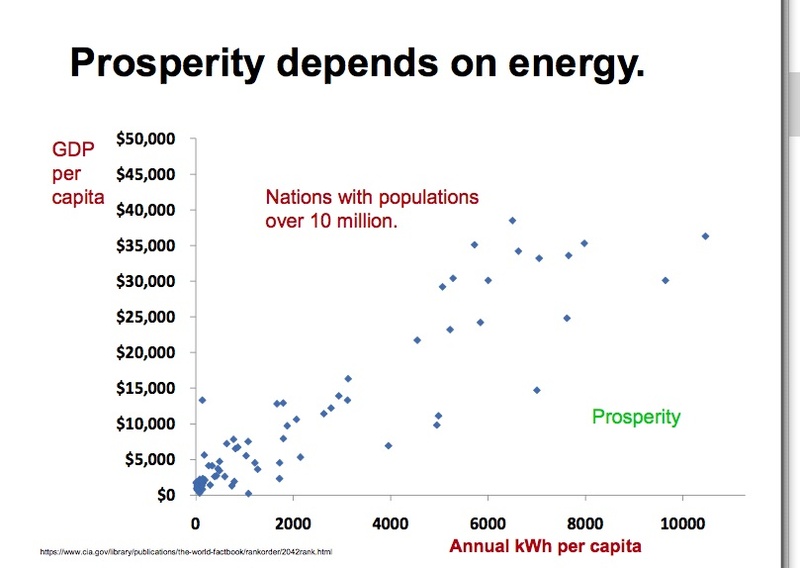 Similarly, the question of electricity use in prosperous nations raises questions. The curve of kilowatt hours versus dollars per capita is pretty straight for at the lower levels of both (below $15,000 a year per capita and I recently blogged this in Why I Love Nuclear. I explained the need for more electricity use, especially in poor countries. Prosperity and electricity improve people's lives, especially the lives of women. Near the same time, Rod Adams did an excellent post about energy and prosperity, and my own post received many thoughtful comments. I was happy to see that all the comments agreed with the necessity of improving lives in poor countries with electricity. However, us rich folks in the U S were another story. Maybe we need to use less electricity, not more? It's possible. Are Rich Nations Wasteful Nations? The method commonly proposed to reduce the use of energy presently is to increase the cost of energy .... Our slide would suggest that the unintended result of increasing the cost of energy, and thereby decreasing the use of energy, is a shrinking economy and a lower GDP per capita. The consensus view is that the less painful way to get America out of its economic problems is to grow the economy. So there we have it. Does America need more energy, or should we learn to make do with less, and be less wasteful? This is mostly a philosophical question, and so I will approach it philosophically. What kind of country do we want? Before I start philosophizing, however, I want to point out that America's energy infrastructure is aging, and power plants need to be replaced and expanded, just to keep the energy use we have now. As CNN reports, blackout rates are skyrocketing in many areas of the country. Since building power plants is not easy to arrange, many people hope that the Smart Grid will be able to levelize use instead. A utility executive from Austin Texas was quoted in CNN: High-tech manufacturers want to locate their factories in places where electricity is most reliable, said Carvallo. "That's where the manufacturing facilities move to. That's where you get your high-paying jobs." Jobs are important. America is hurting in terms of jobs. The Bureau of Labor Statistics reports (August 6) that 14.6 million people are currently unemployed, of whom 6.6 million are long-term unemployed (more than 27 weeks). Most people agree we could use some job growth in this supposedly rich country of ours. I would be happy to see growth in electricity use, if that will help. What Is Waste? What is Philosophy? What is the Good Life? Etc. First, let's distinguish between efficiency and waste. Efficiency is always good. I am on the Energy Committee for my town. We sponsor weatherization workshops, and we have encouraged the recent installation of LED traffic lights. We are moving toward LED street lights, too. Efficiency of energy use is always good, and should be encouraged. Making the same product (a warm home, a well-lit street) with less input is always a Good Thing. On the other hand, efficiency often pays for its capital cost fairly quickly, so even in a complete free-market economy, Efficiency Happens. Efficiency is a practical issue, but not a moral one (in my opinion). Waste is a moral issue, and Karen Street is concerned with the idea that I am encouraging a right to waste. Alas. I am. I don't like to legislate morality with taxes, scarce supply, etc. And I believe that every good thing will be misused by someone. For example, I will have a glass of wine with dinner, and someone else will drive drunk. Since some people abuse alcohol, should we bring back prohibition? I don't think so. It didn't work the first time. People have free will, and people abuse all sorts of things. Energy is no different. Also, I am not nearly as certain that I know what waste is and what waste isn't. Maybe I am mellowing out. For example, I personally dislike SUVs and think nobody needs a car that big. However, I know sincere moms who feel it is far safer to drive kids around Vermont winter roads in a BIG car. They have made a safety assessment, and are willing to pay more for the car, and more for gas, for their kids' safety. Is their choice reasonable? Maybe. Shall I despise these women as energy abusers? I don't think so. Or let's take smaller refrigerators. I find it amazing and annoying that so many people keep a spare refrigerator humming all the time out in the garage. These refrigerators are filled with beer and soft drinks. By golly, such things should be banned! Or should they? Should we all be mandated to have small, European-style refrigerators? 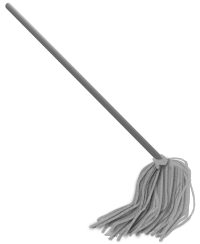 Many European housewives shop regularly, several times a week, which is adorable and a lovely life-style--unless you are person like me, who combined housewifery with responsible jobs. I couldn't possibly shop so often. When I was working, I loaded up on groceries once a week, sometimes twice. In other words, my choices involved a big refrigerator and a station wagon. A big refrigerator meant I could have two kids and a career. If no "American-size" refrigerators had been available, it would have been very hard for me to work. In other words, I wish people were more mindful, less wasteful, and generally all-around better. But I respectfully disagree with Karen about too-big appliances, too-big cars, and so forth. I think these can be reasonable choices. I am advocating for her right to waste. Even in rich countries, abundant energy gives people more choices, including the choice to drive an SUV and have a fridge full of soft drinks in the garage. Some people use those choices "wastefully" in my opinion. They might well think the same of my choices. Abundant energy means freedom of choice. Especially for women. Even in a rich country. My husband is a man of firm opinions, and one of his firm opinions is that he did not want a TV set in his house. In forty years of marriage, we have never owned a TV. However, we bought a set to watch movies on DVD, and we enjoy them. So, from my point of view, TV is all a big waste. All those stations burning kilowatthours to transmit stupid pictures of disasters and The Biggest Loser. Who needs it? I don't. Talk about wasteful! I have added this this rant to prove that dissing people's "wasteful" choices is a bad idea. You diss my refrigerator, I'll diss your TV. This kind of acrimony is not a good way to celebrate diversity. We all deserve the freedom to choose the lifestyle that reflects our hopes and values. So, let's not go around saying "wasteful, bad girl, wasteful." Let's just have lots of clean energy instead. From nuclear, of course. Prosperity graph courtesy of Robert Hargraves. 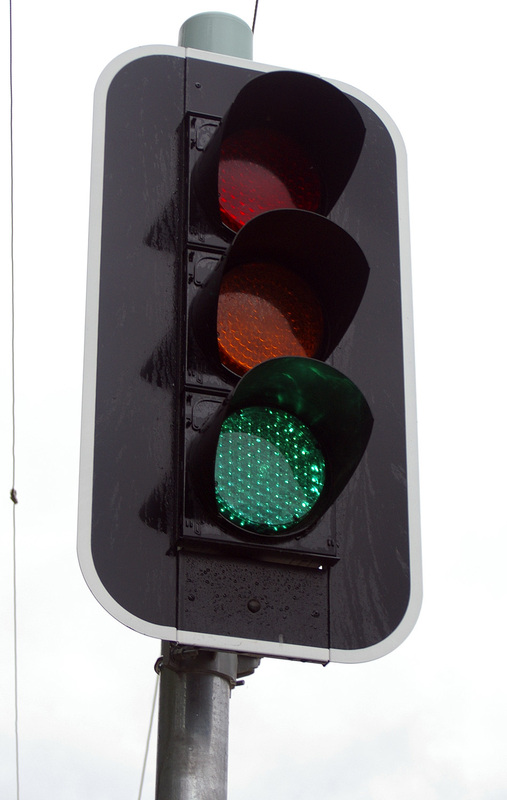 LED traffic light from Wikimedia Commons. It's the Energy. Why I Love Nuclear.